Architecture firm Abitalbero constructed this playful green-roofed wooden pavilion for the entrance of International Exhibition of Contemporary Art OSTRALE in Dresden. The Drachenkopf (or "Dragon's Head") was built using techniques developed for Abitalbero's sustainable tree houses, and it saves over 6 tons of CO2 when compared to conventional construction. For the 2014 exhibition the ongoing project will be joined by a dragon's body that takes the form of a curving meadow-topped ramp. Read on for a closer look at this unique structure. OSTRALE is a popular contemporary art event hosted at the Slaughterhouse made famous by Kurt Vonnegut‘s wartime fiction Slaughterhouse-Five. 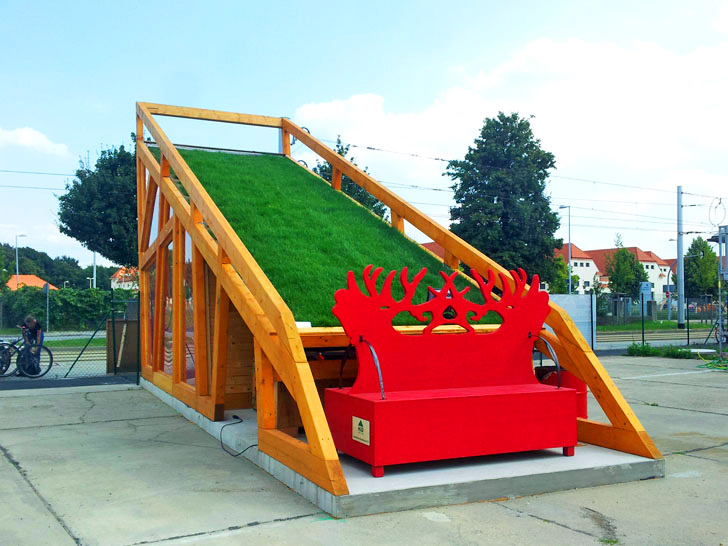 In 2013 Andrea Hilger of OSTRALE and Daniele De Grande of Abitalbero came up with the idea for a ramp topped with a flowering meadow, and the concept evolved into the wooden Drachenkopf that greeted visitors at the entrance to the event this year. Visitors were able to climb onto the green ramp pointed towards the sky, rest on seating at the rear, or enjoy the sun streaming into the space in front of the entrance desk. In 2014, a longer, snaking ‘meadow in the sky’ will take visitors up to the first floor of the exhibition, providing step-free access for all. When complete the two wooden structures will resemble a crouching green dragon. 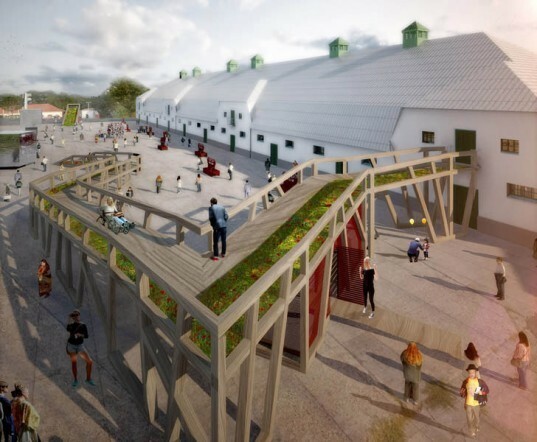 Exactly 6584 kg of CO2 were prevented from entering the atmosphere with the construction of this wooden structure. During construction, the Belgian centre Atelier Creahm ran several workshops that allowed disabled participants to contribute to the build. The structure succeeds by providing the exhibition with a fresh focal point that is sustainably built and accessible to all. In 2014, a longer, snaking 'meadow in the sky' will take visitors up to the first floor of the exhibition, providing step-free access for all. When complete the two wooden structures will resemble a crouching green dragon. The dragon's head, the first part of the plan, formed the entry point to the 2013 OSTRALE exhibition. 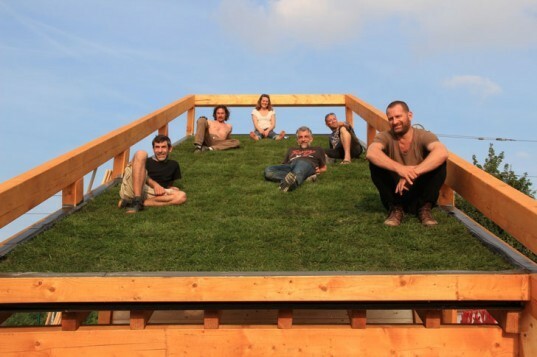 The meadow on the roof points up giving users the feeling of walking up to the heavens. To the rear of the 'Drachenkopf' lies a bright red OSTRALE branded bench. At night the pavilion lights up to provide a glowing focal point outside the more traditional structures of the old slaughterhouse. Visitors were able to climb onto the green ramp pointed towards the sky or rest on seating at the rear, here OSTRALE director Andrea Hilger joins an exhibition visitor on the bench. Sun streams into the visitor reception area during the day. During construction, the Belgian centre Atelier Creahm ran several workshops that allowed disabled participants to contribute to the build. Exactly 6584 kg of CO2 were prevented from entering the atmosphere with the construction of this wooden structure. The structure succeeds by providing the exhibition with a fresh focal point that is sustainably built and accessible to all.